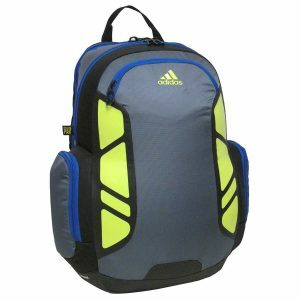 Behind every Adidas backpack is a global group that provides quality sporting goods built with a passion for sports and active lifestyles. The company is named after Adolf Dassler (adi + das), who started making shoes in 1920, with the vision to provide athletes with the best possible equipment. Aligned with major sports events and athletic success for half a century, the Dassler family owned business turning over the “three stripe company” to a corporation in 1989. Today the product range extends from footwear to apparel to accessories for all kinds of sporting activities as a leader in the sporting goods industry, with availability to nearly every country. Headquartered in Herzogenaurach, Germany, the Adidas Group includes over 150 subsidiaries with products sourced from over 60 countries to maintain the highly visible brand. Designed with soccer players in mind, the Dillon Backpack is perfect for hauling your practice gear with space for a pair of cleats, clothes, shinguards, water container and even a size 5 soccer ball. But besides holding all the essentials for a soccer season, the excellent storage features also make for a great gym bag, travel bag or large school bag. Choose to outfit your team with this heavy duty pack or match your uniform and show off in your team’s colors. 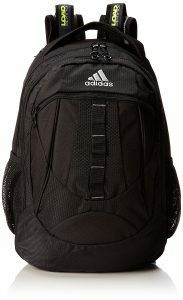 A good option for high school athletes who need a sport and school pack. 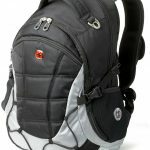 The double zipper compartments include a mesh front ball pocket, internal zips for valuables, a padded cell phone holder and a side water bottle pocket. The inner pack lining comes with FreshPAK, an anti-microbial technology. Among the minor complaints is that the bag gets bulky if filled up to the maximum and the soccer ball compartment can be a tight fit too. 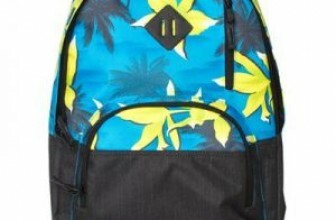 Users who bought the bag for young students found that it is too big for them and better suited for older students and adults. 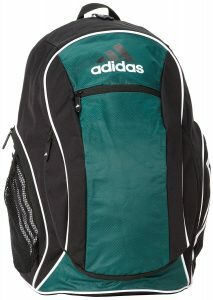 A perfect soccer and school pack with large capacity and special features for carrying gym gear. A monster hauler for carrying big loads, the Estadio Team II swallows all the supplies you need for life on campus or traveling with the office on your back. If you require space, then this pack is one of the roomiest available. All the compartments are big. A main compartment also has a padded laptop pocket that fits a 15″ computer and room to spare. A middle pocket includes an accordian folder for sorting your binders and documents. The front full pocket includes a deluxe organizer with a mesh zip pocket and slots for all your smaller items. A tricot-lined zippered media pouch atop the pack keeps your music player safe and a cell phone holder on the shoulder strap keeps it handy for calls on the go. Plus, two mesh side pockets can hold water bottles or snacks. To help out with heavy loads, the LoadSpring shoulder straps help absorb the shock and the top carry handle provides another option when moving about in confined areas. Though the pack is durable, some users had problems with the inner lining flaking off after a year of regular use. Another user had a seam rip turn into a hole. 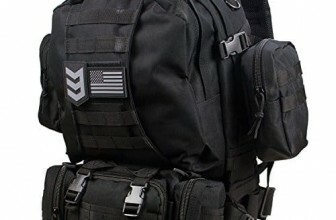 With no chest or waist straps to help carry the weight, a heavy pack may wear out at certain pressure points. 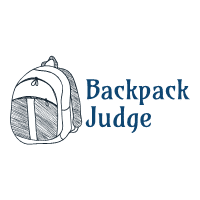 The pack is more deep than tall, so be aware of avoiding overloading if used by grade schoolers and make sure it fits in your kid’s school locker. Colors available: Bloom/Petal Pink, Dirt, Slate Blue, Black, Cayenne, Deep Grass, Red, Deep Navy. One of the largest school bags available with space for a 15″ laptop and good as a carry on pack too. Another hauler for packing all your school supplies, work papers or gym gear, the Ross gets you organized for a full day with some spacious storage capacity. The extra large main compartment combines roominess with added laptop sleeve that fits a 15″ computer and the second compartment is almost just as large. The front panel has a zippered pocket with a deluxe organizer. The tricot lined media pocket secures your music player or other delicate items in a safe place and the shoulder strap cell pocket keeps your phone nearby for easy access. LoadSpring shoulder straps help absorb the shock of heavy loads to take the stress of your back and an air mesh back panel provides additional comfort. A sternum strap also keeps the pack more steady and balanced when on the run. Users were pleased with the choice of vibrant colors and the spacious size that fit textbooks, notebooks and a laptop. Some users liked the organizational qualities of the pack, while others did not. Colors available: Black, Cobalt, Red, Storm Grey, Deep Grass, Deep Navy, Cayenne. 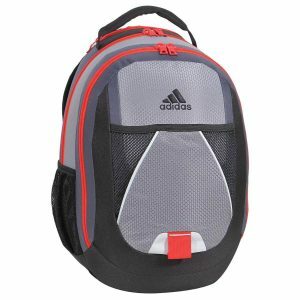 A good capacity pack for school or office with two large compartments, two mesh side pockets and a laptop sleeve. A great bag for recreation, school or travel, the Climacool Speed combines roomy capacity with exceptional sporty features for a very practical, high quality and good looking pack. Soccer players and gym enthusiasts will find the two separate and ventilated wet/dry compartments a big bonus for storing dirty cleats or soggy workout clothes. Plus, pullout mesh net zips open from the bottom and clips into the front panel to carry a soccer ball, volleyball or even a damp swim suit. Durable for everyday use, this deep pocket bag is strong enough to hold a locker full of heavy textbooks, binders and a laptop. 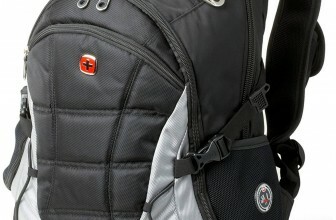 Built with quality materials, users appreciated the pack’s superb construction and excellent stitching. Keeping the ball outside and enclosing cleats/shoes in separate sections avoids getting the main compartments dirty. The FreshPAK anti-bacterial lining also keeps your bag odor-free. Other features include a media pocket with headphone portal, two adjustable side water bottle pockets, a front panel deluxe organizer, a padded air mesh back panel and a tarpaulin bottom for weather protection. Overall users were highly satisfied with the sporty performance of the pack with a minor complaint of the lack of a waist belt for heavy loads. It was suggested that the bag is too big for children under ten years old. Colors available: Black, Red, Forest, Collegiate Blue, Light Blue, Collegiate Navy, Collegiate Royal. 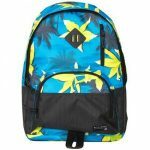 A superb recreational pack with extra capacity and functional features for sports gear that doubles as a practical and durable school bag. With such a global presence, Adidas confronts the challenge of balancing shareholder interests with sustainability principles. Their vision is to enhance social and environmental performance in the company and the supply chain, thus improving the lives of the people making our products. With an understanding to look after the natural environment, product designs incorporate lifecycle analysis for environmental impacts from product start to disposal. Supplier sites are expected to follow best practice examples for production and environmental performance with development of guidelines and training programs to reduce impacts. For community affairs, the company defers to local employees and communities to initiative relief efforts and donations. For an in-depth analysis of their performance and progress, the company produces a Sustainability Performance Review each year to assess targets.